I attended a delightfully thought provoking lecture yesterday hosted by the UCLA Department of Physics and Astronomy – “Colloquium Thursdays” featuring noted theoretical astrophysicist from Caltech Sean Carroll. The theme for the talk was “The Origin of the Universe and the Arrow of Time” which was right up my alley since cosmology is one of my chosen few areas to expend brain cycles. The lecture hall was packed to the rafters with a standing-room-only crowd of graduate students, professors, and physics enthusiasts like me. It even attracted a handful of local crackpots, but I’ll get to those game highlights later. Dr. Carroll delivered a fast-paced treatise of current cosmological thought. It was truly invigorating. He started with a discussion of entropy and the arrow of time, using the example of our ability to turn eggs into omelets but not vice versa and that we can remember the past, but not the future. He pointed out that this can be traced to the tendency of entropy to increase, in accordance with the Second Law of Thermodynamics. Carroll presented an excellent example of entropy by showing a picture of inflationary cosmologist Alan Guth’s office, a hoarder’s delight. Austrian physicist Ludwig Boltzmann worked on entropy in the 1870s. Carroll showed a picture of Boltzmann’s grave. 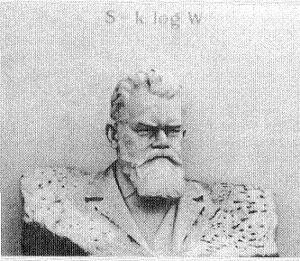 Did you know that Boltzmann has an equation on his grave’s headstone (see inset picture)? Not the Boltzmann equation surprisingly, but rather a probability equation that estimates entropy: S = k log W where S is the entropy of an ideal gas, W is the number of microstates corresponding to a given macrostate, and of course k is the Boltzmann constant. What equation would you like on your tombstone? Carroll’s talk ebbed and flowed into discussions of quantum gravity, black holes, inflation, the multiverse, roughly paralleling his recent new book “From Eternity to Here: The Quest for the Ultimate Theory of Time.” I’m still wading through this very thorough treatment of the subject but I can say that as a leading thinker in cosmology today, Carroll has come up with an excellent general audience book that can get you quickly up to speed. It does make your head hurt to think about these things though, so I warn you ahead of time. Getting back to the unavoidable attraction to physics lectures by some crackpots, there was a short Q&A session after the talk and I felt like shrinking in my seat when an elderly woman sitting on the floor up front and wearing a large floppy purple hat asked how many dimensions Dr. Carroll thought there was, since various “religions” like Hinduism believed in a certain number. I was impressed by how calmly Carroll handled this kind of question by quickly bringing it back to the subject of the lecture and providing a respectful response. And not to be left out, Westwood’s local red-faced homeless surfer guy was also there and as per his norm (like he did with Nobel Laureate David Gross at a lecture a couple of weeks ago), he followed the speaker around like a hungry Schrodinger’s cat. He actually made some sensible comments this time, asking about Kaluza-Klein theory and recurrence times. This guy remains an enigma. As I’ve said many times here on the SLB, take advantage of all opportunities (before entropy takes over) to see your favorite scientists in person, you won’t be disappointed! Thank you, it is really nice article. "What equation would you like on your tombstone?" I have thought in that seriously for a moment after I have read your article, . I think may be Newton's equation of motion or Newton's law of gravity. I am kind of classical and traditional person. I just bought a copy of S. Carroll's book w the link on your blog. I didn't know about it. It is great. Thanks a lot!! !